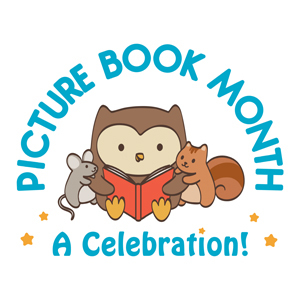 November is picture book month and at Picture Book Month you can read a new essay about picture books every day in November. Contributors include Doreen Cronin, Brett Helquist, Tom Lichtenheld, Chris Raschka, John Rocco, Jon Scieszka, and Karma Wilson. So check it out and read a picture book every day. “I think my life in China was pretty ordinary.” So begins a series of personal reflections from Na Liu, as told to her husband, award-winning graphic novelist Andrés Vera Martínez. 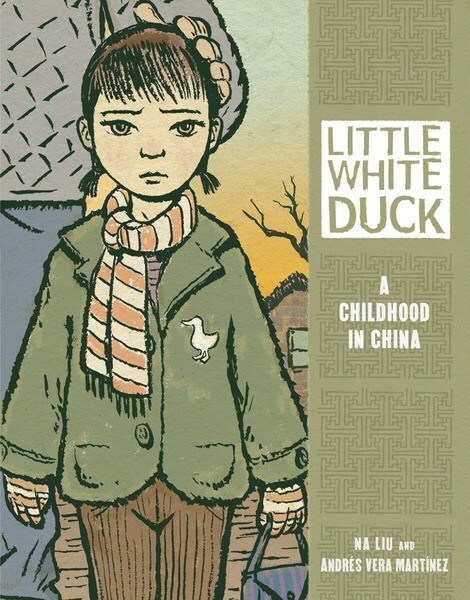 Little White Duck: A Childhood in China, captures a range of childhood emotions in a historical context and perspective that seem at once authentic and--to an American audience, at least--anything but ordinary. After a brief intro, the authors relate Liu’s recollections of Chairman Mao’s death. Sentimental and moving, the grief of her parents at the passing of Mao Ye Ye (Grandpa Mao) is palpable and genuine. Even the frame in which the parents announce the sad news communicates a sense of fracture, as the revolutionary photo of Mao hanging on the wall behind them is placed between the speakers, making it impossible to miss Mao’s face as you scan left-to-right from the daughter’s perplexed look to her parent’s sad expressions. But this is no gushing paean to Chairman Mao or the Chinese Communist Party. Little White Duck offsets sentimental reflections on the People’s Liberation Army treating her mother’s childhood polio with bitingly frank reminders of the excesses of Communist zeal (such as the Party’s call to exterminate pests such as sparrows, which precipitated a famine as locusts and other insects devoured the crops). My favorite chapter deals with the heroic--and largely mythical--character of Lei Feng, a model soldier lionized by the Party as an example of selfless service. The Lei Feng episode is as hilarious as it is illustrative of the book’s keen sense of conflict between the idealism of the CCP and the tragic shortcomings of a revolutionary zeal that was all-too-often naïve. 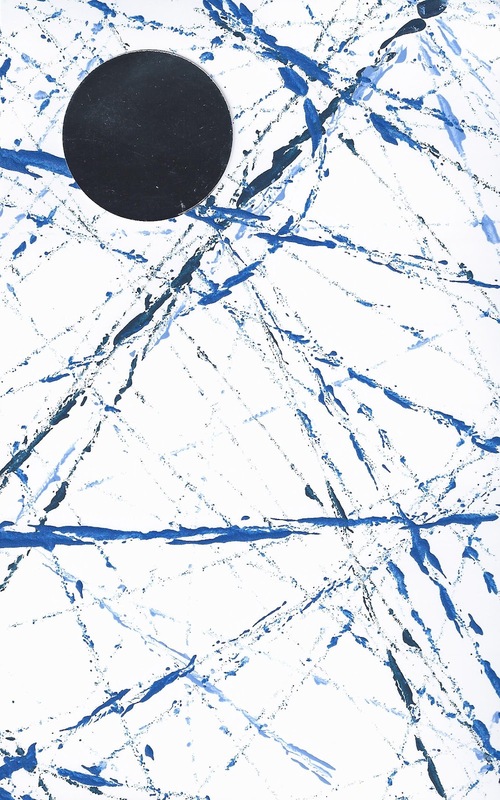 Martinez’s bold lines and muted tones set a mood of quiet reflection; one that fits perfectly the bittersweet nature of these stories. Though the narratives seem a bit disjointed to me (two of the stories are out of chronological order, which sent me flipping back through the book just to re-orient myself), the chapters dealing with Mao’s death, the Lei Feng chapter I described above, and the final chapter (I won’t give this one away) provide enough of a framework to hold the other seemingly random recollections together. 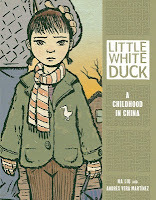 All in all, though, I would say that Little White Duck will speak to anyone who has ever been a child--even if you don’t know much about China--and will give you more to think about than you might expect from a graphic novel intended for a young audience. At our house we divide responsibilities: I help my children with any and all math homework, and my husband helps with the assignments that involve art. Always. So when my first-grader brought home a school project that involved clay, I happily got out of the way and let them work on it together. I suppose it was a very serious project because they worked mostly in silence, but at one point my son broke the silence by saying, "I like to read nonfiction." Quickly picking up this unexpected conversation, his dad replied, "Oh, I do, too. I like to read books about history." My son said, "I don't read much history. I like to read books about animals." And then after another interval of silence he added, "I get most of my information from books." 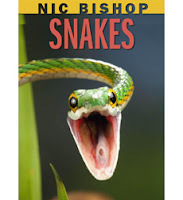 And that is probably why my sons and I were so excited when Nic Bishop Snakes came out this year. Nic Bishop combines fascinating information about animals and stunning photography to make books that we love to read again and again. Not attempting an exhaustive overview, Bishop instead gives readers a glimpse into the world of snakes, discussing physical attributes (the green anaconda "may weigh more than 400 pounds"), feeding habits ("eight big meals a year are enough for many snakes"), and defenses ("a viper can strike . . .as fast as you can blink"). He highlights specific snakes, including the handsome fellow on the cover -- the parrot snake. But the thing that makes this book stand out is the spectacular, full-page photography. Whether close-up or actual size, each photograph shows not only a different snake, but subtly directs the reader's attention to a particular snake characteristic. The green tree python shows off gorgeous green coils. The venomous feathered bush viper's scales are prominent in a photo that is 3 times actual size. The Asian sand viper and the Gaboon viper demonstrate camouflage dramatically. The emerald tree boa sticks out his tongue, and the eyelash viper displays some really scary fangs. Bishop gives readers a you-are-there experience with pictures that feel impossibly real. (Actually, since I wouldn't linger to examine any snake I came across in the wild, I got a better-than-you-are-there experience.) And each photo is one you'll want to linger over, except perhaps the one of the garter snakes -- that'll give you nightmares. Now, a quick word about the book's design. The colored text pages complement the photographs, particularly the brilliant yellow that picks up the pattern on the Mandarin rat snake. The smaller type used to spotlight the specific snakes helps pacing. But the larger, bold type used to highlight a sentence on each page of text is disturbingly random. While some of the sentences seem like main ideas for the page, others do not. Why would, "That is why many snakes ambush their victims" be emphasized? Also, certain paragraphs felt out of place and would have made more sense on a previous page. But these are small quibbles that shouldn't keep you from picking up the book. Who else but Nic Bishop could make a feathered bush viper look adorable? In the end notes, Bishop said he wanted to "show how beautiful snakes are" and he did it! 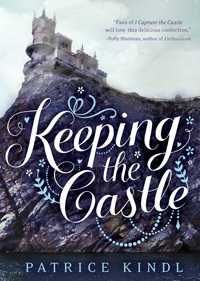 I was so excited to read Keeping the Castle, and when it had finally reached the top of my to-read stack, I was thrilled. I read it quickly, and decided I liked it almost right away. While reading reviews about this book, I noticed that many of them referred to this book as another Jane Austen. I had never read any of Jane Austen's books, and so I decided to pick up the "dreaded" Pride and Prejudice. What I found was first, Pride and Prejudice should never be dreaded, and second, Keeping the Castle was very unimpressive. Keeping the Castle is a bad imitation. In the book, Mr. Frederick, a substitute for Mr. Darcy, says, "I hate to see things poorly made, cheap copies of good pieces and so on," I feel like this is one of those "cheap copies". At first I liked this book a lot. It had a great plot, it was a romance, and it was funny. "'When I first came here, they told me you were one of the most beautiful women in Europe. Quite frankly?' he said, 'I could never see it.' 'I beg your pardon!' 'I won't be marrying you for your much-vaunted beauty, Miss Crawly.' 'You say it is not for my beauty and it cannot be for my fortune. Once again, therefore, I ask: why do you want to marry me?' In truth, I would have married him whatever the reason, but still, I wished to understand. He looked uncomfortable. 'Really, I suppose it is because I like quarreling with you. When I went away to London I meant to forget about you in my head. I couldn't concentrate on my work. In the end, I wrote to my mother. She's a clever woman, my mother. She explained that I was so miserable because I was in love with you. So I thought I would [come back] just to see if she was right.' 'And was she?' I asked. His eyes searched my face. 'I expect so; my mother is generally right. And you like quarreling with me as well, you know you do. Oh, please, Althea, look at me. Do say yes.' I relinquished any attempt to control my amusement at this unconventional declaration of devotion, and laughed out aloud. 'Oh very well then, yes! I accept. Yes, sir, I will marry you.'" I really liked this part, and many other parts. But, compared to Pride and Prejudice, This is nothing. "'Let me thank you again and again, in the name of all my family, for that generous compassion which induces you to take so much trouble and bear so many mortifications, for the sake of discovering them [Lydia and Mr. Wickham].' 'If you WILL thank me,' he replied, 'let it before yourself alone. That the wish of giving happiness to you might add force to the other inducements which led me on, I shall not attempt to deny. But your FAMILY owes me nothing. Much as I respect them, I believe I thought only of YOU.' Elizabeth was too much embarrassed to say a word. After a short pause, her companion added, 'You are too generous to trifle with me. If your feelings are still what they were last April, tell me so at once. MY affections and wishes are unchanged but one word from you will silence me on this subject for ever.' Elizabeth, feeling all the more than common awkwardness and anxiety of his situation, now forced herself to speak . . . 'I do, I do like [you].' She replied with tears in her eyes, 'I love [you].' The happiness which this reply produced, was such as he had probably never felt before; and he expressed himself on the occasion as sensibly and as warmly as a man violently in love can be supposed to do." Keeping the Castle is just a simplified, more boring, not as well written, and not as well thought-out Pride and Prejudice. So, I would advise to not waste your money and time reading and buying Keeping the Castle, go buy Pride and Prejudice. I loved Pride and Prejudice, and would definitely recommend this book. It was cleverly written, and has almost the same plot as Keeping the Castle, but a little better. When my mom first mentioned this book, I rolled my eyes. I asked if it was non-fiction, (which I am not a huge fan of . . .) and then I asked if it was the stupidest book she had ever read. After I got the answer that, no, it was not nonfiction, and no, it was not the stupidest book ever, I still wasn't satisfied. I think I might have mumbled something about not reading it. But, when my "to-read" book list dwindled down to nothing, I got desperate. I picked up the book and almost put it down again. I like romance, but not the really, cheesy romance that no one can even believe would ever happen. But, I decided to give it a try--for the first two chapters. "She can hear the smile in his voice. 'I'm doing my summer research project on different styles of dancing.' 'So does that mean we'll be doing the tango next?' 'Only if you're up for it.' 'What are you really studying?' He leans back to look at her. 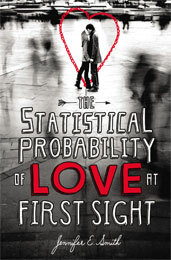 'The statistical probability of love at first sight.' 'Very funny,' she says. 'What is it really?' 'I'm serious.' 'I don't believe you.' He laughs then lowers his mouth so that it's close to her ear. 'People who meet in airports are seventy-two percent more likely to fall for each other than people who meet anywhere else.' 'You're ridiculous,' she says, resting her head on his shoulder. 'Has anyone ever told you that?' 'Yes,' he says, laughing. 'You actually. About a thousand times today.'" He is so sweet to her throughout the book--even when she does some dumb things. My friends all laughed when they heard what I was reading, it sounds really weird, but it is really, really, really, good! I'm cheering for Bomb, and I'm going to try to get my hands on a copy of Endangered before the winner is announced in mid-November. It all started many years ago on my oldest son’s last day of first grade when he brought home a collection of poems that his class had memorized during the year. He was so adorable reciting, “Thumbs in the thumb-place, Fingers all together!” and “Paddle once, Paddle twice, Paddle chicken soup with rice” that I decided to spend more time with the poetry he had learned by having him illustrate each poem. We used paint, glitter, fabric, stickers, colored paper, and colored pencils to illustrate those poems, and I found that as we did, we came to love them even more. Over the years my children and I have repeated this activity -- gathering poems and trying to find creative ways to express how they make us feel (particularly challenging for non-artist me) -- and in the process, we have increased our appreciation of the poetry. We have read, memorized, and illustrated poems by Judith Viorst, X.J. Kennedy, Emily Dickenson, Aileen Fisher, Eve Merriam, Carl Sandburg, Marchette Chute, Bobbi Katz, and many others. We cut index cards into pieces and glued the pieces onto a separate piece of paper. Then the kids placed a blank sheet of paper on top of the index-card covered page and colored over it with crayon. They cut their colorful umbrellas from the colored sheets. 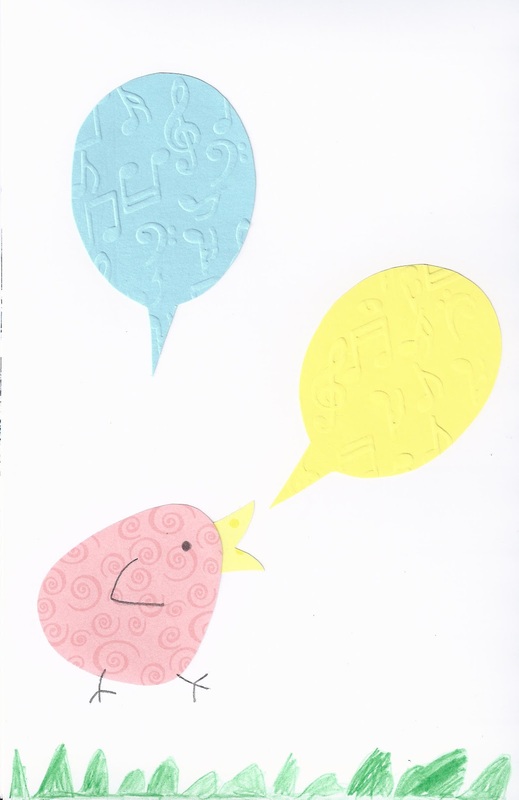 The word bubbles are embossed with musical notes. 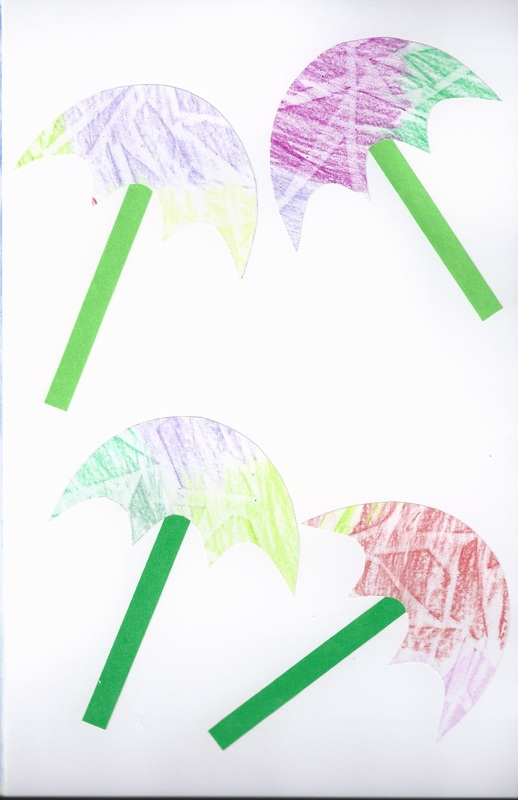 The bird bodies are cut from scrapbook paper, and the kids used colored pencil to draw the detail. Each child made bees from their yellow-inked fingerprints. The detail was added with color pencil. This picture was fun to make and super easy. 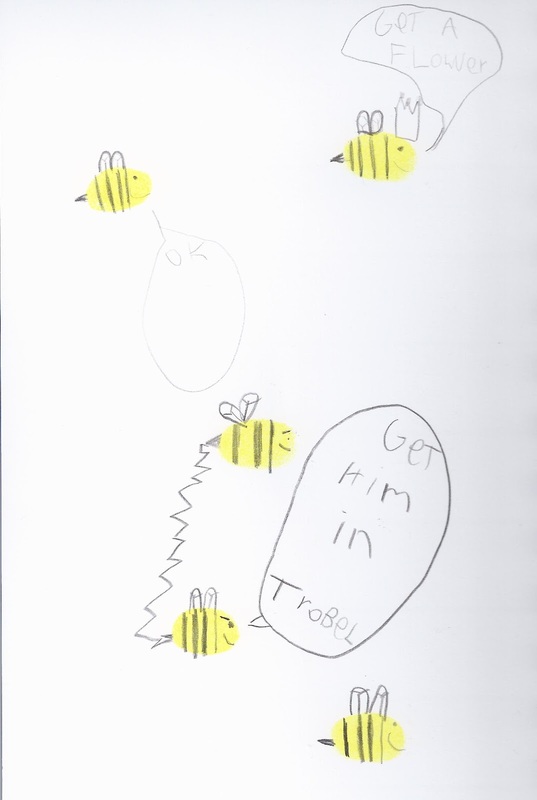 I especially liked seeing all the personality my kids put into "every bee that ever was." I lightly taped a piece of cardstock in a flat box, and let the children roll paint-covered marbles across the page to create "dreams". We then glued a moon cut from mirrorboard to each picture. I just wish summer could have lasted longer. I find my feelings divided over the disappearance of the Dewey Decimal System. On the one hand, I can see children checking out more nonfiction books if they can browse them easily by topic. And, at our library, folktales and poetry seem to be overlooked because they are stuck with the "numbered books" that parents and children don't browse through as often. However, when we go to the library, we aren't usually looking for books about a certain topic, but we do regularly go in search of books by an author whose other books we have enjoyed. I sure would like to visit the Ethical Cultural Fieldston School and see their new system in action. You can read an article from School Library Journal about it here.